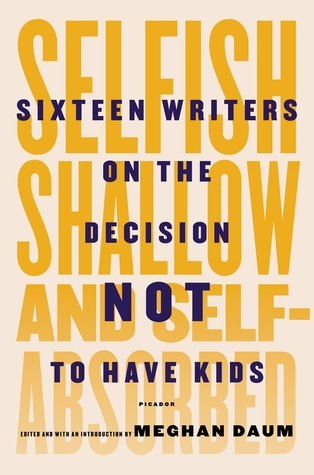 Edited and selected by novelist and essayist Megan Daum, Shallow, Selfish, and Self-Absorbed is a collection of essays by writers about the decision not to have children. Though all the contributors are authors, most do not seem to feel that writing has taken the place of children. Rather, they have a wide range of reasons for choosing not to have kids. Some of their decisions were very conscious and active, while others were more passive decisions that were made by failing to act. Many contributors had close calls, and had to deal with miscarriages or abortions. One writer deliberately pursued single motherhood through artificial insemination, only to be relieved when the pregnancy ended in miscarriage. Through this range of material, the collection interrogates the idea that opting out of parenthood is self-serving or indolent, and reveals the many different assumptions society makes about those who choose not to reproduce. A number of trends emerge from the essays. Women significantly outnumber men, and most of the writers are old enough now that children are unlikely if not impossible. The predominance of women perhaps reflects the increased scrutiny women face from society as they reach the end of their childbearing years. In general, while most of the men who contributed seemed constant in, and sure of, their decision, the women often revealed deep-seated anxieties and uncertainties that were only enhanced by social pressures. Fear of today’s intensive middle-class American parenting style features prominently in many of the essays. “I suspect that my commitment to and delight in parenting would take precedence over anything and everything else in my life; that my mastery of motherhood would eclipse my need for—or ability to achieve—success in any other arena. Basically I’m afraid of my own competence,” writes Anna Holmes in “Mommy Fearest.” This intensive parenting trend finds a strange counter-point in the serious lack of parental leave and benefits that currently exists in the United States, and indeed the writers in the collection are predominantly American. Many of the writers were eager to strike down the presumption that they dislike children because they do not want any of their own. Courtney Hodell writes about her fierce love for her brother’s daughter, while Pam Houston writes about loving her unexpected stepdaughter, while also being happy her partner is not the custodial parent. Sigrid Nunez finds herself disturbed by those childless adults who express dislike for children, perhaps having absorbed the common belief that such an attitude is unnatural. As a whole, this collection neither disparages parenthood, nor advocates the child-free life, but simply seeks to ease some of the stigma that surrounds the decision by offering a window into the minds of those who have made it, and found it to be the right choice for them. Once inside, it shows that the variety within the group is at least as great as that between those who choose children, and those who chose not to procreate. Within its scope—predominantly female, American writers—the collection offers a varied look at a personal decision loaded down with a great deal of cultural baggage.